UK ONLY 1st Class £3.99 FREE when you spend over £30! 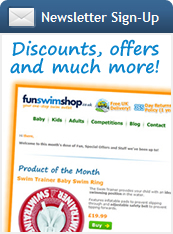 We will make every effort to deliver within the time stated on FunSwimShop.co.uk but we will not be liable for any loss caused to you by late delivery. Chargeable Guaranteed Next Day deliveries (Special Deliveries) are arranged through couriers or the Royal Mail Guaranteed service and in both cases signatures are required. Guaranteed next day deliveries apply to weekdays only (excluding Bank Holidays) and to orders placed before 3pm. Orders placed after 3pm will be processed the next working weekday, with delivery taking place the working day following that. Where a courier is used you will receive an email (provided the information is available to us) on the morning of the delivery and stating the anticipated hour of delivery. If the Products are not delivered within the estimated delivery time which we quote, please contact us by telephone or email and we will try and ensure that you receive your order as quickly as possible. Please note that for items sent by Royal Mail 1st and 2nd class post, Royal Mail state that only items still not delivered after 15 working days can be officially classified as lost. If you prefer, you may cancel your order and we will refund the money you have paid (your refund will therefore not be processed until after the official Royal Mail 15 working day lost period). Please order from FunSwimShop.co.uk with enough time to prevent any loss or disappointment resulting from the delivery time as we cannot be responsible for this. Please note that cheques must clear before orders can be shipped and should be denominated in UK Pounds, drawn on a UK bank and made payable to Mailsports International Ltd. Please also remember to include delivery fees otherwise there may be a delay in processing your order. For all the offline numbers and addresses you may need please check our contact details. In stock orders placed before 3.00pm are dispatched from our warehouse on working days (excludes weekends & holidays), subject to stock availability and any security checks. Please allow sufficient time for us to process and get your order to you especially if you have a tight deadline. If in doubt call us for assistance. Your safety is guaranteed because funswimshop.co.uk uses the latest security measures to protect your details when you shop with us, see our Safe Shopping Guarantee. We use 128-bit SSL Software to encrypt your credit/debit card information when you place an order on our secure server, which means that only we are able to decrypt the information in order to process your transaction. - a "padlock" symbol (or key) in the bottom right-hand status bar of your web browser. If you feel you have a complaint you wish to make please e-mail us at sales@mailsports.co.uk or call 01628 529206.